CSEZEN series offers a multi functional comprehensive smart protection solution for Feeder, Generator, Mot0r&Transformer segment. CSEZEN family of protective relays are advance numerical relays that provide multi protection and monitoring with reliable and fast protection solution in a single unit. In this family of CSEZEN series, the CSEZEN-T is an advanced Transformer protection relay designed for controlling, protecting and monitoring industrial installations, public distribution networks and substations. 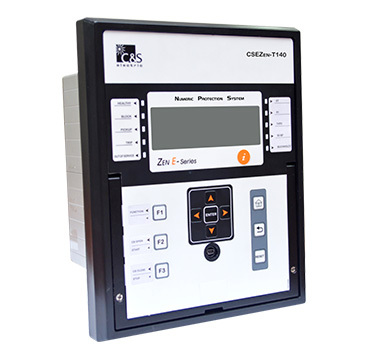 CSEZEN-T also provides an automation solution of power control. It complies with IEC 60870-5-103, IEC 61850, Modbus protocol for high integration of protection & control. CSEZEN-T offers following features in a compact & smart flush mounting enclosure. CSEZEN-T relay will cover wide range of protection functions required for Transformer segment. It can be used as part of protection scheme for transformers and generator transformers. CSEZEN-T relays can also provide back-up protection for HV and EHVtransmission systems.